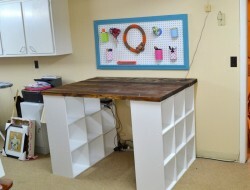 With two small bookshelves as table legs, a thick board for the working surface, and a little paint, you can build yourself a craft table. What makes this furniture idea perfect for arts and crafts is that you have great storage for all your supplies where you can easily access them. The wider table top and elevated height make work easier as well – they allow more space for you to move around. Arts and crafts, small construction projects – what would you use this table for?